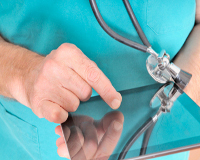 A new report from healthcare market research and advisory firm Manhattan Research indicates that physician use of tablet computers has almost doubled since 2011. The annual “Taking the Pulse” study found that tablet adoption for professional purposes reached 62 percent in the first quarter of 2012, compared with 35% during the same period last year. 81% of those surveyed who use tablets said they use the Apple iPad. Nearly half of the surveyed physicians who use tablets stated that they have used their devices at the point of care. The report also noted that physicians with tablets and smartphones in addition to their desktop/laptop computer(s) spend more time online with each device and spend more online time during the workday than physicians with only one or two Internet-capable devices. Over two-thirds of the respondents watch videos from Web sites like YouTube and WebMD to stay updated and educated on clinical information. Mobile devices are also being used often to research symptoms, prescribe medication, access reference databases, and read medical news. Tablet computers can be a secure part of an Electronic Medical Records (EMR) solution like Medisoft Clinical, McKesson Practice Choice, or Lytec MD. Contact a healthcare technology consultant at Microwize Technology for more information.